Classic hole. Down hill tee shot that dog legs left to right with trees on the right and water on the left. The green is guarded by water short, hazard left and bunkers right. 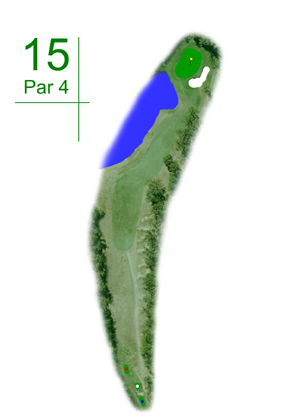 The tee shot should be aggressive to be as close to the green as possible on the flat, not the down slope of the fairway. This will leave a short iron to the green that slopes to the hazard. The sucker pin is front left.